Yesterday I had the distinct pleasure of chatting on the phone with Jules McKenzie of Melbourne’s own Money For Rope. Fresh from their performances at South By Southwest in Austin this past weekend, the band was in Clarksdale, Mississippi, making their way to the Music City to play live at the Springwater Supper Club and Lounge this coming Wednesday, March 19th. JM: I had a couple of different bands, and there are a lot of musicians in Melbourne, it’s a music scene place, everyone knows each other and plays in a couple of different bands, and it was getting too hard to manage, so we decided to join the two of them and keep the family together, well, we lost a bass player in the process because he was busy with another friend’s band. That’s what we wanted to do, we wanted to keep the family together. We aren’t the first band in history to have two drummers; there is another band I really dig that I watched a few times in Melbourne, The Dirt Bombs, they have two drummers. Officially, I love the look of it. Some bands have two guitars, so why not? We would’ve had two bass players as well if the original bass player had been able to play too. The person that gets the benefit of most of it really is me, usually, because I’m standing in the middle between them. I don’t know if it translates all the time to everyone else standing at the back of the room, we tend to make fairly gritty-sounding recordings, and it’s lost a little bit in that, if it was more hi-fi it would be more obvious. For the benefit of us on stage, we’re really attached to it, it feels like a party to us. It’s not a complicated thing. Eo8: You’re in Clarksdale, Mississippi at the moment, isn’t that the home of crossroads where Robert Johnson sold his soul to the devil? Are you planning to sell your souls while you’re there? JM: Exactly! You know, if we had souls…no really, we left Austin and drove through the night, we’ve got this RV we rented, and we got here 5:00 this morning. We are playing at this amazing place called The Shack-Up Inn, it’s in a collection of old buildings that have been moved to one property in downtown Clarksdale, it’s phenomenal, we’ve been wandering around checking out the scene down here. Eo8: How was Austin and playing South By Southwest? JM: It was mind-blowing. This is the first trip for most of us ever to America, let alone to a festival like that, and to be honest, it’s a little overwhelming, there’s just so much stuff on, it’s chaos the whole time, and I just don’t know how Austin puts itself through that every year, to be honest. There are so many people, so many bands, and there’s just something happening the whole time. It was a real blast, it was great fun, we played four shows while we were there. Eo8: Have you enjoyed the States so far? Encountered any difficulty in people understanding you, or you understanding us? JM: We’ve had an amazing time; we started off in Seattle, we play a show, jump back in the car and drive, arrive at a venue, play a show, jump back in the car and drive. We had two days off in Austin, but to be honest, everyone was desperate for a sleep at that point. We are on a lot of highways, which is a cool way to see America, and we’ve fallen in love with the place. People don’t understand us very well at all, we were trying to fix a cable that was broken and we needed some soldering gear, and no one could understand what we were asking for. We just have different words for stuff, you know? A lot of our words are English words, like we call rubbish ‘rubbish’ and you guys call it ‘trash,’ and it’s those little words you don’t realize are that different in conversations. We spend a lot of time together as a band, and we’ve kind of developed our own language with each other, and a lot of times even other Australians don’t understand what we’re saying. Eo8: From your observations so far, what are the similarities and differences between the American music scene and the Australian music scene? JM: It’s similar; you probably break them up a similar way to us, ours is ‘state-based’ pretty much. For us, the main music scenes in Australia are Melbourne, which is really the heart of the music industry, then you have Perth, like where Tame Impala and Pond are from, if you haven’t seen Pond, you’ve got to check them out, they’re incredible. Sydney’s a whole different culture musically, as is Brisbane. When we arrived in Seattle, we thought, “hey, this is a similar kind of scene to Melbourne.” You’ve got the Austin scene, a big New York scene, and then the South as a whole is another thing entirely. To us, there’s a Melbourne scene particularly, where bands play for years, there’s a lot of competition, a lot of bands, more bands than people in the scene, and by the time you actually get anywhere, you’ve done the hard yards of the pub circuit. It seems like if you’re a legitimate band in America, you’ve done the ‘hard yards’ kind of thing, you’ve been playing for a long time, you’re dedicated to it all, there’s that similarity. It’s hard to stand out, even just in Melbourne. There’s something like 5,000 bands in Melbourne, it’s pretty competitive. Eo8: You definitely seem to have a good time with each other, and you also don’t seem to take yourselves too seriously, which is refreshing. 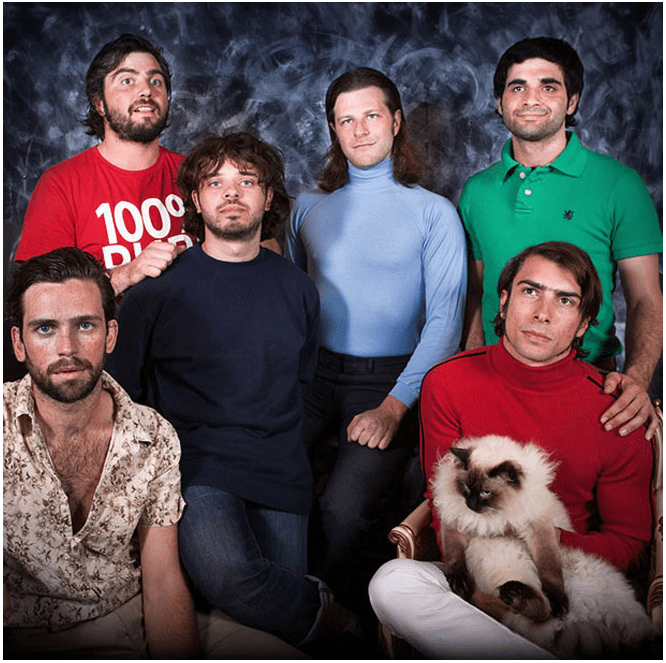 Are you familiar with the website www.awkwardfamilyphotos.com, and just how comfortable was that blue turtleneck? JM: You know, I’ve never seen the site, but you’ve seen our photo I suppose? We believe in what we do, but at the same time we are laid back with stuff and like to have fun. One time we were on a tour with Fraser A. Gorman, who is another dude you should check out. We were playing in a tiny town called Bellerat, we’d bought all these clothes, dressed up in them, and were on our way to a photo/portrait place that was in the middle of a big department store there; we’re wandering around in these clothes, and the photo booth section used to be in the middle of the ladies’ lingerie there. We’d been up for a couple of days, and we’re looking pretty seedy, we’d grabbed a case of beer, and these people are all just going “what are you doing here? You’re wandering around in the women’s lingerie, wearing this kooky stuff,” and that’s not a good way to look when you’re in Bellerat, you’re not going to go down well with the locals. Then we found out that the portrait place had closed, like, four years ago, so we’re stuck in these clothes just wandering around all day. As far as the blue turtleneck goes, I still have it, it’s not uncomfortable but it’s extremely tight around the armpits. We ended up doing the photo at a friend’s house instead. That cat was just around there and jumped up into Rick’s lap, and we were like, well, that’s fine. Eo8: What would you all be doing if you weren’t playing in Money for Rope or playing music in any other bands? JM: My family has a farm out in the country, out east, that’s near a reservoir, and I’ve been kicking around this idea recently of being a freshwater crayfish farmer. Ricky, the keyboard player, is a teacher, he teaches music, and he doesn’t mind working with kids, I could see him doing that kind of thing. Our bass player, Cini, he’s like the most quintessential Italian man, and he would probably be working as a laborer, having an awesome wife, and cooking all day, I think he’d be okay with that description. We’re all sort of floating around at the moment doing strange work to make these trips happen, and pretty much always have been, and that kind of prevents you from having a normal career. Eo8: Using the best analogy, metaphor, simile, paradox, oxymoron, or any other very descriptive phrase you can muster, how does performing/playing music make you feel? JM: It’s a little like being a scared kid on his first date with a real, live, girl, on a ferris wheel-y type ride, who’s not sure how he’s supposed to be acting, but he’s having a pretty sick time, a little bit petrified at the same time, wondering if he wore the right t-shirt. Money for Rope will be playing in Memphis on March 18th, in Nashville on March 19th, in San Antonio performing at the Maverick Music Festival March 21st and 22nd, and then heading to the UK to play the Great Escape Music Festival in May.